– June 7, 2015Posted in: SusieQ FitLife Breaking News, SusieQ FitLife Updates! Recognizing and celebrating women & mothers everywhere is what Fox5 NY does annually. Whether you are a new mom-to-be, a mom to many, or possibly a guardian who has adopted children or a hardworking single parent you are appreciated! 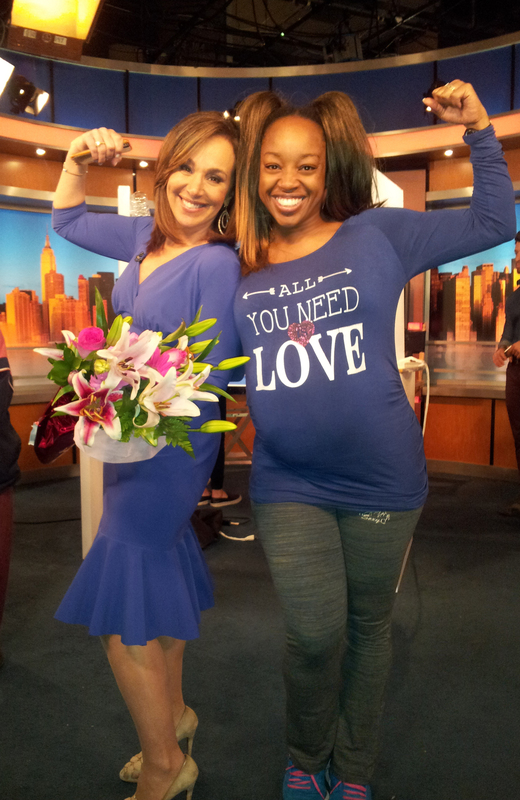 Good Day New York hosts, Greg Kelly & Rosanna Scotto featured many moms for an entertaining Mother’s Day celebration complete with a fashion show, performance by Ashante’ and various gifts! Rosanna Scotto asked SusieQ FitLife about whether moms should dress their daughters as “mini-me” versions of themselves. SusieQ joked about whether Kim Kardashian would create the fashion trend first (see video clip). Labor pains can be hours or days away for SusieQ who is about to give birth any minute now! If only moms could skip the delivery portion and jump into motherhood it would be awesome, says “Q”; who reflects on the passing of her mother last year shortly after getting married in September. Many cool mom’s filled the studio including Rosanna’s mom and singer Ashante’s mom, who broke down in tears while watching the R&B star’s emotional performance (watch tribute performance). Mothers should be celebrated every day, says SusieQ’s mother-in-law, MommyK! Take the time to acknowledge and respect the person, who raised you and gave you life, every day of the year… you never know how long they will be in your life! Carrying a baby for nine months is not the easiest thing for a mom to do! There are also women who have never bared a child but love or care for nieces/nephews or have adopted children or who love children within their own community! It does take a village. Where would we be without our Mothers today? Does motherhood begin when a child is conceived in the womb or does it begin when a mother begins to raise and care for a child? Keep in mind that some men are single fathers and may take on the motherly role as well. Interestingly, there are many people who do not choose to honor moms or acknowledge the holiday for religious reasons as it was originally a memorial date on May 10, 1908 held by Ann Jarvis; who later regretted how commercialized an event it became. Jarvis’ initial thought was to honor her mother’s passing and honoring all mothers in general. No matter what stage you are in your life it is good to reflect on the best lessons that you have learned from your parent/guardian whether they are still alive and well or they have unfortunately passed on. Did they instill confidence in you or taught you how to cook so you could eat for life or were you taught to stand up for yourself or shown unconditional love? Be sure to share your thoughts or comments with us below. Not every experience or reflection may be positive, however let’s be sure to grasp the life lesson and give thanks for receiving the gift of a FitLife! 26 Things to Know Before Giving Birth!